Whether you’re running a resource intensive software program for work, managing your email, or just surfing the web, you want your computer to be as fast as possible. In the age of streaming and instant gratification, even a small slowdown can be a big problem, leading to slower performance over time. If you purchased your Windows PC some time ago, you’ve probably witnessed this slowdown firsthand. Your brand new computer, once blazing fast, now just drags, weighed down by various factors impacting performance. Sure, you could buy a new computer, but before you do that, try these proven ways to enhance the performance of the PC you already have. One of the most effective ways to boost performance on a Windows PC is to add more memory. Adding RAM will make every program on your computer run faster and more efficiently – and this upgrade is easier than you might think. Adding RAM to your desktop computer or laptop doesn’t require much more than a screwdriver to install the part, but if you need help, ask your IT provider to install the memory for you. Some computers come pre-installed with bloatware, unnecessary programs and trial packages you may or may not want to keep. In addition to those bloatware programs, you may have installed additional packages along the way, including software you no longer use. Removing those programs can speed up performance in your Windows PC so you can focus resources where you need them most. You can access your list of installed programs through the Control Panel on your Windows PC and from there, select which you would like to remove from the machine. Most modern PC’s offer plenty of hard drive space, but they can quickly fill up over time, especially if you’re not saving data to the cloud. When free space begins to diminish, the performance of your PC can suffer dramatically. If your Windows PC is running more slowly than it used to, check the amount of space you have available. If space is running low, backing up large files or moving to the cloud could make a big difference. If you have the capacity, copying rarely used but important files to multiple places builds in redundancy which can help you avoid data loss. This is perhaps the easiest way to boost the speed of your Windows PC. Simply rebooting can restore lost speed by freeing up memory, clearing away temporary files and giving the computer a fresh start. Microsoft releases updates on the second Tuesday of every month, the majority of these patches are security related and rebooting allows for these updates to be installed. Even if you leave your desktop or laptop on 24/7, you should always reboot occasionally. Rebooting once a week or a couple of times a month is good for your computer, and you should notice an increase in speed when the reboot process is complete. Multitasking may seem like a good idea, but it often causes more problems than it solves. The human mind can only focus on so many things at once, and exceeding that limit could make you less productive instead of more. 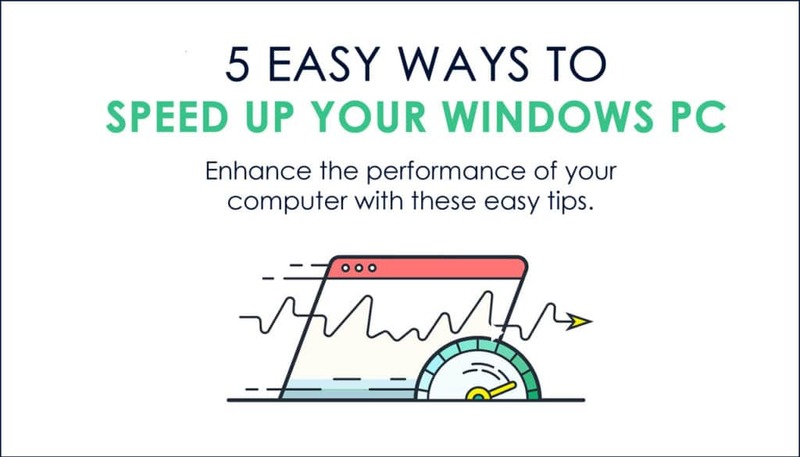 Keeping too many windows open can also slow down your PC, so try closing some inactive windows to boost performance and free up resources whenever your PC starts to drag. There are a variety of causes of computer slowdowns and working through them one by one is generally the best way to resolve the issue. For a worry-free approach to desktop management, you could keep all PC’s on your network running at peak performance with Ontech’s Total Desktop Care. Through this done-for-you managed service, you can leave all PC maintenance issues to us. Ontech will be notified if your hard drive is full, if you’re reaching maximum capacity, or if your PC needs a reboot. With Total Desktop Care, we evaluate the performance of your Windows PCs, so you can worry less and get more done. Some causes of computer delays are obvious, but others are more sinister. Hidden dangers like viruses and spyware can slow your Windows PC down to a crawl – and put your personal information and sensitive data at risk. These hidden dangers also pose a significant risk to your business network. A single connected computer harboring a virus could spread the infection company-wide in a matter of minutes, compromising the security of company and customer data. Security is a hot topic these days, and for good reason. Today, there are a variety of tools available to business users to help secure desktops and laptops across your entire network. Security awareness training is one of the best ways to turn your biggest security threat (computer users) into your first line of defense. Ontech offers comprehensive training for business users, such as running simulated phishing scam tests to gauge cyber security awareness throughout the company. The accounts receivable department could, for instance, be tested with both legitimate and scam emails masquerading as invoices. This simple exercise can uncover vulnerabilities while enhancing the security of your network. We can help you determine if a hardware upgrade is needed, if the device is infected by a virus, or if another type of intervention is needed.